J. M. Howell and H. C. Smith, supervising eds. 2 vols. Chicago: S. J. Clarke Pub. Co., 1915. Alexander Hale Smith was born in the little town of Far West, Missouri, on June 2, 1838, inheriting right and title to strong character and pure, clean blood from two worthy streams of ancestry, his surname coming to him through sturdy, intelligent, respectable New England stock from the earliest years of the seventeenth century, when one Robert Smith set the first family rooftree in the historic state of Massachusetts, in the county of Essex, in what is now known as Topsfield, near the picturesque little Ipswich river. Running swiftly with the years, the family shared in the romance and history of the state and community, taking places of honor and trust as the need arose, whether fortune led them to battle, legislative hall, forum, pulpit or plow, counting the nation's glory their glory and her betterment their duty, until, in the course of generations, one Joseph Smith was born of Asael Smith and wife in the old family home in Topsfield. This man married one Lucy Mack, a woman born of the blood of heroes in the month of July, 1776, leading to the final development of a man born for a message and a mission when in the beautiful heights of the Green Mountains of Vermont their son Joseph was born. Moving westward, this boy met his work in the hills of Palmyra , New York , and delivered to the world the Book of Mormon and founded by revelation the Church of Jesus Christ of Latter Day Saints. By reason of his translation and presentation of the Book of Mormon to the world, he was known to them as the Mormon Prophet. This man joined his life fortune to Miss Emma Hale of Harmony, Pennsylvania, a woman coming through a line of refined, "well-to-do" pioneers of excellent and strong character and of good repute. To this union came the subject of our sketch, Alexander H. Smith, the fifth son and sixth child. The fortunes of the church had led the parents, Joseph and Emma (Hale) Smith, onto the western frontier and into the acquaintance of General Alexander W. Doniphan, with whom Joseph Smith was counseling in the matters of church property and with whom he was studying law. This intimacy being ripe at the time of his birth, the little son born in Missouri was named for the hero of Sacramento, Alexander, the mother's name, Hale, following it in his signature and record. The persecution of the church and troubles arising therefrom threw the father, with many other of his brethren, in a Missouri jail while this child was yet an infant. The mother, with difficulty and much suffering, made her way before the edict of evacuation, issued by Governor Boggs to the "Mormons" across the state to the shores of the Mississippi . This was in February of 1839. The river, wide and dreary neath the grey sky, lay frozen and chill. With the small son, Frederick, and baby, Alexander, in her arms and little son, Joseph, and adopted daughter, Julia, clinging to her dress, Mrs. Smith crossed the river on foot and found protection from mobs and menacing foes on the friendly shores of Illinois, in Quincy, at the home of Mr. Cleveland. Here her husband found her and together they removed to Commerce, Illinois , afterward and ever since known as Nauvoo. Buying an old but strong and comfortable blockhouse from Hugh White, this they made their home and here come first the events of memory to Alexander. The Church rallied to this point and grew to a people of thousands. When the man was but a child of six years there were imprinted upon his mind the horrors attending the killing of his father and uncle by a mob in Carthage . Blurred and terrorized into more or less confusion, the scenes attending those months were like a hideous dream to the man in after years. Swiftly there came dissension within the circle of his acquaintance that he felt in a childish way, and then the troubled time of war and finally the evacuation of Nauvoo. His mother's brave and singularly well possessed spirit shielded him from many things then as well as through his boyhood, which was spent at Nauvoo, either in the "Mansion," a hotel owned and conducted by his mother, or at the Homestead, the old blockhouse added to and improved upon and occupied at times by the family, or maybe on the family farm a few miles east of Nauvoo. He grew to manhood, received his education, formed his friendships and in 1861 was married in Nauvoo to Miss Elizabeth A. Kendall, daughter of John and Elizabeth Kendall. She was born near Liverpool , England , but was reared in and near Nauvoo, being left an orphan when but eight years of age. Mr. Smith allied himself with no religious sect until after his brother Joseph took his place as the head of the remnant who remained true to the original faith and doctrine of the church and refused to follow Brigham Young and drink of the cup of his iniquitous doctrines. With this little band of followers who invited his brother to take his legitimate place as their earthly head, he joined his powers for good and became a missionary for the Reorganized Church . In company with William Anderson and James Gillen he made the trip across the plains of North America to California with a small span of mules, one wagon and a riding pony. This journey was beset with many perils and unguessed hardships, attended as it was by dangers from wild men and wild beasts and the intrigues and hatred of the western church. This mission was the first one of many to the western lands. His home was in Nauvoo until 1876 with the exception of two years spent at Plano , Illinois . In the spring of 1876 he removed to Andover , Missouri , near the Iowa line on the south, the beautiful country in and surrounding Decatur county having attracted his eye. He lived on this farm for five years, removing from thence to Independence , Missouri , stopping en route for one year at Stewartsville , Missouri , but keeping his farm across the Iowa line. 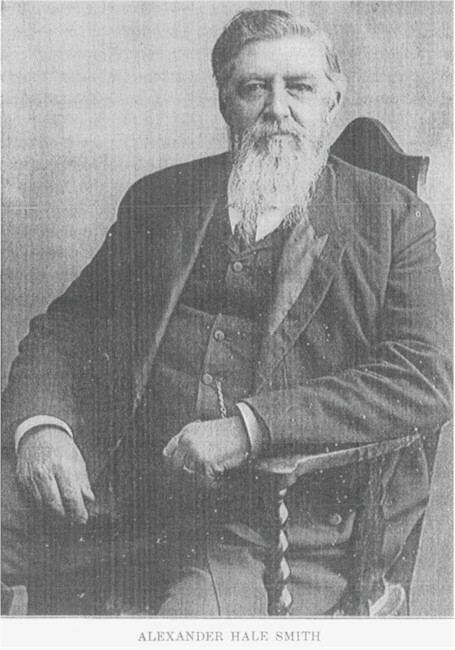 In 1890 he bought his home in Lamoni, Decatur county, Iowa, and there spent the remainder of his life, when not traveling in the interests of his church work, in which connection he traveled and preached from the Atlantic to the Pacific, in the southern states and to the Great Lakes and Hawaii and the Society Islands, holding the office of an apostle, for many years an active member of that quorum, later counselor in the presidency and at last president of the Order of Evangelists and Patriarchs. He died in the Mansion, his own property, while on a hurried visit to the old town of Nauvoo , on the evening of August 12, 1909 , after an illness of three nights and three days. Mr. Smith was a man of keen, sensitive, impulsive nature; big-hearted, big-bodied, moved quickly to action, to tears or to laughter; throwing himself into any undertaking with zeal and devotion. He was a forceful, eloquent speaker, moving sometimes in poetic language and similes when under the fervor of deep feeling. With friends he was jovial and easily approached and affectionate, although rigid in his ideas of morals and ethics. He moved with quick, springing step and erect figure and always with dignified bearing. Politically he claimed the faith of "an old-time Lincoln republican" and lived the life of a patriot. He loved the wide outdoors, land and water and sky, and delighted in athletic sports, holding a record in his younger days as one of the best skaters and one of the two surest shots in the community. Of the nine children born to him, one daughter, Mrs. Grace Madison, died and is buried in San Bernardino , California , and one son, Don A., is buried at Lamoni. The second daughter, Mrs. Ina I. Wright, lives at Avalon , New South Wales , Australia , and Mrs. Coral Horner near Davis City , Iowa . Mrs. Emma Kennedy and the youngest sons, Joseph G. and Arthur M., reside at Independence , Missouri , while the oldest children, Fred A. and Mrs. Heman C. Smith, are residents of Lamoni, where the widow still lives in their home on the south side. Mr. Smith was buried in Rose Hill at Lamoni , Iowa , and left the record of a busy, honest, progressive citizen, without fear and true in very truth to the high principles for which he always stood defender and promulgator. GEORGE SMITH is one of the prosperous agriculturists of Decatur county, owning three hundred and twenty acres in his home place on section 36, Long Creek township, and eighty acres in Franklin township. He was born near Burlington in Des Moines county on the 29th of December, 1839 , a son of Peter and Martha (Ellison) Smith. His parents, who were natives of England, emigrated to America in 1835 and, making their way westward, settled near Burlington, Iowa, the father entering land three miles south of that city. Although he followed the miller's trade while living in England , he gave his attention to agricultural pursuits after coming to this country. He became the owner of four hundred acres of fine land, which he operated until his demise, which occurred in 1870 when he was seventy-five years of age. His widow survived until 1881, passing away when eighty-one years old. To them were born thirteen children, as follows: Ann; William; Edward; Samuel; Jane; John; Ellison; George; Sarah; James; Alfred, who died while crossing the ocean; and two who died in infancy. George Smith was reared in Des Moines county and after completing the public school course entered Denmark Academy at Denmark , where he supplemented the education which he had previously acquired. He remained with his parents until he was of age and then rented land from his father, which he operated until 1871. In that year he came to Decatur county and purchased eighty acres of land in Long Creek township, to the improvement and cultivation of which he devoted his energies until 1875. He then bought an additional eighty acres, removing to his new holdings, where he resided until 1899. In that year he purchased an adjoining one hundred and sixty acres and took up his residence on that place. He has brought his home farm, which comprises three hundred and twenty acres, to a high state of cultivation and has also made many improvements upon an eighty acre tract in Franklin township which he owns. There are two sets of buildings upon his land and everything is kept in excellent condition, while he has always used improved machinery and progressive methods in the work of the farm. His labors have yielded him a good income and he has accumulated a competence. On the 3d of May, 1865 , occurred the marriage of Mr. Smith and Miss Margaret Jane Sharp, who was born on the 15th of December, 1843 , in Mount Sterling , Brown county, Illinois . Her parents, John and Sarah (Hemphill) Sharp, were both natives of Pennsylvania and were born of Irish and of Scotch ancestors respectively. They became early residents of Illinois but after remaining there a few years removed to Des Moines county, Iowa, where the father entered land, to the operation of which he devoted the remainder of his active life. He died in January, 1881, when seventy-three years of age, and the mother died in July, 1913, when she had reached the remarkable age of one hundred and one years and four months. To Mr. and Mrs. Smith have been born nine children, five of whom survive, namely: Martha E., born February 6, 1868, who is now the wife of C. A. Imhoff, a farmer of this county; Alfred G., born April 22, 1870, who is farming land belonging to his father; Sarah Alice, whose birth occurred September 30, 1879, who gave her hand in marriage to Arthur Richey, an agriculturist of this county; Carrie A.. born December 12, 1880 , who married George Redmond, a farmer of Long Creek township; and Horace Guy, born : February 27, 1884 , who is carrying on agricultural operations in Long Creek township and who married Maud Severn. Those who are deceased are: Frank O., born February 14, 1866, who died in November, 1881; Charley, born July 3, 1875, and who passed away March 15, 1906; Harry S., whose birth occurred on April 27, 1878, and who died in January, 1881; and Maggie, born September, 1887, who passed away the following month. Mr. Smith is a stalwart democrat but has never taken an active part in political affairs. His religious faith is that of the Methodist Episcopal church. On the 3d of May, 1915 , he and his wife celebrated their golden wedding anniversary, on which occasion all of their children and grandchildren and other relatives were present, and the occasion was a thoroughly enjoyable one. The house was beautifully decorated and a fine dinner was served the guests. Mr. and Mrs. Smith received many presents and all rejoiced with them in the many years of happy married life which it has been their privilege to enjoy. During the afternoon friends and neighbors called to extend their congratulations and good wishes. HEMAN C. SMITH, author, minister, editor and lecturer, was born in Gillespie county, Texas , at what was then the town of Zodiac , September 27, 1850 . His father, Spencer Smith, son of Heman and Clarissa (Goodale) Smith, was born in Tioga county, New York , December 14, 1817 . His mother was Anna Christiana Wight, daughter of Colonel Lyman and Harriet ( Benton ) Wight. She was also a native of New York , born at Centerville , Allegany county, September 30, 1825 . Although born in the south, Mr. Smith was a thorough New Englander in ancestry, tracing his descent from over thirty families who landed on Puritan soil in the first twenty-five years of settlement. These men were among the founders of Plymouth , Boston , Watertown , Salem , Dorchester , Ipswich , Dedham , Medfield, Eastham Hingham, Newbury, Roxbury, Amesbury, Northampton and Deerfield in Massachusetts ; of Windsor , Wethersfield , Guilford , New Haven and Woodstock of Connecticut. Among the most prominent were Stephen Hopkins, one of the Mayflower Pilgrims and signer of the first compact of free government in the history of America; John Chedsey, deacon of the first church in New Haven and a signer of the Connecticut state constitution of 1643, the first written constitution in our history; and William Phelps, an organizer of Dorchester, Massachusetts, in 1630, the first town in America to have an organized government, also a founder of Windsor, Connecticut, in 1635 and for a long time its chief magistrate. That branch of the numberless Smiths to which Heman C. belongs had its American beginning with Ralph Smith, who came to Plymouth in 1633 from Hingham, England, and settled finally in Eastham in Cape Cod, where his son, Samuel, died in 1696, his grandson, John, in 1734, and his great-grandson, Samuel, about 1760. The family intermarried with the families of Hopkins, Deane and Snow. The son of Samuel Smith, Heman, was born at Eastham in 1741, emigrated to Berkshire Hills and settled at Sandisfield , Massachusetts , before the Revolution. He was captain of a company of the first Berkshire county regiment in the war and in 1793 helped found the town of Berkshire in Tioga county, New York , where he died in 1833. His son, Heman, married Clarissa, daughter of Isaac Goodale, another Revolutionary soldier. They were the grandparents of Heman C.
Upon his mother's side, Mr. Smith was descended from Thomas Wlght, who came to Watertown , Massachusetts , before 1635, descended from a family of knights with holdings in Surrey , England , since the twelfth century. Thomas Wight helped found Dedham and Medfield and was one of the original donors of "Indian corns for ye building of ye new brick college at Cambridge 's in 1636." He died at Medfield in 1673. His son, Ephraim Wight, died at the same place in 1722, his grandson Nathaniel moved to Killingly, Connecticut , about 1725. Nathaniel's son, Levi Wight (1712-1797), died at Oxford , Connecticut , and his grandson, also Levi Wight, born in 1761, moved about 1794 to Herkimer county, New York , and died in Allegany county, New York , in 1830. The son of this Levi Wight was Lyman Wight, born in 1796 at Fairfield , New York . He served in the War of 1812 at Sacket Harbor and Lundys Lane . He joined the Latter Day Saints church in Ohio and affiliated with that church in Ohio , Missouri , and Nauvoo , Illinois . In Missouri , in 1838, he was commissioned captain of militia by Governor Boggs and fought vigorously to prevent the Missouri mob from seizing his land and that of his fellow believers. He was made an apostle in the church in 1841 and after the death of Joseph Smith, in 1844, he refused to recognize the claims of Brigham Young and led a small band of settlers into Texas in 1845. Here his grandson, Heman C Smith, was born. He lived with his parents in the counties of Gillespie, Burnett, Llano and Bandera, Texas, until the spring of 1858, when his father, discerning the probability of war between the states and preferring to be on the northern side of the line, moved northward by team, making a temporary home in the Cherokee country of Indian Territory until the autumn of 1860, when he moved into Jasper county, Missouri, and engaged in the milling business. Warned again by the spirit of approaching hostilities, he started northward in the spring of 1861 as soon as grass was sufficiently large to support his team and other stock. This time he got well within the northern lines, making his first permanent stop on the Boyer river in Crawford county, Iowa, just opposite where the town of Arion is now located. After a few years in Crawford county, residing at different points, the family removed to Shelby county, where they resided at Gallands Grove in Grove township until Heman arrived at his majority. There being a large family to support and his father being a man of limited means, he was obliged to labor on the farm during the summer months, but he improved the winter months in attending the common schools and was always at the head of his classes, especially in mathematics and history. At the age of twelve years he became a member of the Reorganized Church of Jesus Christ of Latter Day Saints and very early in life became an earnest advocate of the faith promulgated by this church, in the days of Joseph Smith, and an uncompromising opponent of polygamy and kindred ideas introduced by Brigham Young and associates. He entered the ministry in the spring of 1874 and was occupied constantly in the missionary field until 1909, when he was released to serve more exclusively in his position as general historian of the church, to which he had been elected in 1897. During his missionary work he traveled extensively throughout the United States and the British Isles , always ranking among the leading preachers of his faith. Since devoting himself to historic work he has gained considerable prominence among men of that class. He is now, in addition to being the authorized historian of the church of his choice, a member of the Mississippi Valley Historical Society, the Iowa State Historical Society, the Nebraska State Historical Society, the Topsfield Historical Society, of Topsfield, Massachusetts, the American Church Historical Society, with headquarters at New York city, the National Geographical Society and secretary of the Decatur County (Iowa) Historical Society. He is also editor of the Journal of History, published at Lamoni , Iowa , by the reorganized Church of Jesus Christ of Latter Day Saints; president of the board of trustees of Saints Children's Home of Lamoni , Iowa ; fellow of American and Church History of Graceland College, Iowa, as well as serving on several boards and committees in church work. Mr. Smith is the author of the authorized history of the Latter Day Saint church, in four volumes; "The Truth Defended," "True Succession in Church Presidency," as also many pamphlets and tracts, besides numerous articles for church and historical magazines. He was married, June 2, 1886 , at Independence , Missouri , to Miss Vida Elizabeth Smith, daughter of Alexander Hale and Elizabeth ( Kendall ) Smith and granddaughter of Joseph Smith, the "Mormon" prophet. Mrs. Smith has been a sympathetic, able associate of her husband in all his activities. She is the author of the "Young Peoples History of the Church" and an author and poet of extraordinary ability, her songs being favorites in the Sunday-school services of her church. After their marriage, Mr. Smith was in charge of the missionary work in the Pacific coast and made his home at San Bernardino, California, where the following children were born: Heman Hale, April 28, 1887, now a teacher of economics and modern history in Lincoln high school of Seattle, Washington; Vida Inez, January 16, 1889, now the wife of James W. Davis, of Honolulu, Hawaii; Anna Earlita, November 28, 1890, now Mrs. Evan E. Inslee, of Seattle, Washington; Lois Elizabeth, November 3, 1892, who married Walter G. Badham, of Lamoni, Iowa, and died March 27, 1914. The family removed in 1893 to the present home of Mr. Smith at Lamoni. In addition to his other work Mr. Smith has found time to take an active part in local affairs and in politics He has served his community as member of the school board, president of college trustees and member of the city council. In politics he has been allied with the Bryan democrats since the campaign of 1896, although he stands for non-partisanship in all local affairs. He is often chairman of party conventions and in 1910 made the race for the legislature, cutting a normal republican majority of four hundred to one hundred and thirty-three. As an orator he is always in demand at celebrations, political campaigns and at old settlers' and soldiers' reunions. As a debater he has a long record of discussions with opponents of the Latter Day Saints. For more than three decades James R. Smith was prominently identified with the agricultural interests of Decatur county but is now practically living retired in a comfortable home in Lamoni. He was born in Lewis county, New York, April 3, 1841, a son of Peter and Emmeline Smith, who were both natives of Germany but, emigrating to the new world in an early day, were identified with the farming interests of Lewis county for a long period. Both spent their remaining days in the Empire state and passed away there. In their family were three sons, one of whom is living in the east. James R. Smith was reared in the Empire state to the age of sixteen years and during that time he acquired but a limited education. At that early age he heard and heeded the call of the west and accordingly, in 1867, made his way to Illinois , and found employment at farm work near Mendota, in La Salle county. He was married in Jo Daviess county, that state, in 1864 and in the fall of 1866 continued his journey westward to Decatur county, Iowa . In the following year, 1867, he located upon a farm southeast of Lamoni, which continued his home throughout a long period. When Mr. Smith came to Iowa he had three horses and a wagon and but a few hundred dollars in money. This money he invested in land, which was then in a wild state, for at that time this county was but sparsely settled and wild game was numerous. Mr. Smith went to work and in course of time had the raw land in a good state of cultivation. As he prospered he added to his holdings from time to time until he became the owner of a large amount of land, being at the present time the possessor of eight hundred and forty-five acres. He not only raised the cereals best adapted to soil and climate but also engaged extensively in raising stock, making a specialty of high grade cattle, and this returned to him a good income. It was some twenty years ago that he removed to Lamoni and embarked in the grain business, becoming one of the largest buyers of grain in this section of the state. He also assisted in the organization of the Farmers State Bank at Lamoni and is still serving as its vice president. Eventually, however, he disposed of his business interests and for the past fourteen years has lived retired, giving his attention to his invested interests but leaving the active work of his farm to younger hands. He has been a successful man and his success is based largely upon the fact that he was thrown upon his own resources early in his career, which developed in him a spirit of self-reliance and determination to make for himself a place in the middle west. As previously stated Mr. Smith was married in Jo Daviess county, Illinois , in November, 1864, to Miss Eliza A. Graham, and in 1914, after a happy married life covering five decades, they celebrated the fiftieth anniversary of that event. Mrs. Smith was born in Stephenson county, Illinois , a daughter of Theodore and Lena (Tucker) Graham, natives of Ohio and Missouri , respectively. They were married, however, in Illinois . In 1866, the same year of the arrival of Mr. and Mrs. Smith in Iowa , they, too, journeyed to Decatur county and Mr. Graham purchased a farm located south of Davis City and west of Pleasanton , in Hamilton township. There he was busily engaged for many years with the improvement and cultivation of his place but both he and his wife departed this life many years ago. He was successful in his undertakings and was a stanch supporter of the republican party. Of their family two sons and four daughters survive: Mrs. Viola Landphair, of Pleasanton , Iowa ; Mrs. Warren Little, of Missouri ; Mrs. Lydia M. Olds, of Jo Daviess county, Illinois ; Mrs. Smith; William H., who is living retired in Lamoni , Iowa ; and Benjamin F., who makes his home in Harrison county, Iowa . To Mr. and Mrs. Smith have been born eight children, of whom six survive and all but one were born in Iowa . Clarence F., a farmer and stockman of Lamoni, is married and has one daughter. Theodore J., who also follows farming and stock-raising near Lamoni, is likewise married and has a family. Minnie B. is the wife of D. F. Kaller, a traveling salesman, who makes his home in Lamoni. Gertie is the wife of Bert Teale, of Mount Ayr , Iowa . Louie is the wife of A. Otis White, who is engaged in the undertaking business in Lamoni. Arthur H. is married and has one child. He is now operating the home farm near Lamoni. Since age conferred upon him the right of franchise Mr. Smith has given stalwart support to the republican party and has served as a member of the board of supervisors, while for the past thirty years he has acted as school treasurer - a fact indicative of the confidence reposed in him by his fellow townsmen. In matters of religion he and his family affiliate with the Methodist church, and fraternally he is a Mason, belonging to the blue lodge at Lamoni. The position he has attained and the success he has won is the outcome of energy and perseverance intelligently applied in his early manhood. To few is accorded the privilege of traveling the journey of life together for a period of more than fifty years as Mr. Smith and his estimable wife have done and to few is accorded the high regard and esteem that this venerable couple enjoy from all with whom they are brought in contact. For fourteen years Elder John Smith has been president of the Lamoni branch and of the Lamoni stake of the Reorganized Church of the Latter Day Saints and pastor of the local congregation. He was born in Stockport , Lancashire , England , February 8, 1844 , a son of Henry and Mary Smith, the latter of whom died when our subject was but three months old. He was but a boy of about twelve years when his father died and in his early youth began to provide for his own support. The father was a weaver by trade and was quite well known in his community. He was active in politics and kept well informed as to public affairs. To him and his wife were born four children and our subject has a sister, Mrs. Edward Smith, who is living in England at the age of seventy-six years. The grandfather served under Wellington at Waterloo and received a pension from the British government. When but eight years of age John Smith was placed in a mill to learn weaving and before that had been employed at running errands. However, he was able to spend some time in school while a boy and by close application and the habit of reading during his spare moments, he gained quite a good education. In 1862, when eighteen years of age, he emigrated to the United States and in the following year enlisted in the United States naval service as a landsman, and served for over a year, being then honorably discharged. He is now receiving a pension from the federal government. Upon returning to civil life he again took up his residence at Fall River , Massachusetts , where he had settled on first emigrating to this country. In 1865 he became connected with the Reorganized Church of Latter Day Saints and the following year began preaching in the east. He was especially active in the ministry at Fall River and New Bedford , Massachusetts , and in addition to his work as a preacher found time to serve as justice of the peace, which office he held for fourteen years, or from 1886 to 1900. He was appointed for two seven year terms, his efficiency and honesty being attested by the fact that he was appointed by both a republican and a democratic governor. While in New Bedford he was for several years engaged in grocery business and also devoted considerable attention to real estate and insurance. Shortly before the expiration of his second term as justice of the peace Mr. Smith emigrated westward and located in Lamoni , Iowa . From the time of his arrival in Lamoni, on the 31st of March, 1900 , to the present, he has been active in church work here and since May, 1901, has been pastor of the local congregation of the Reorganized Church of Latter Day Saints. 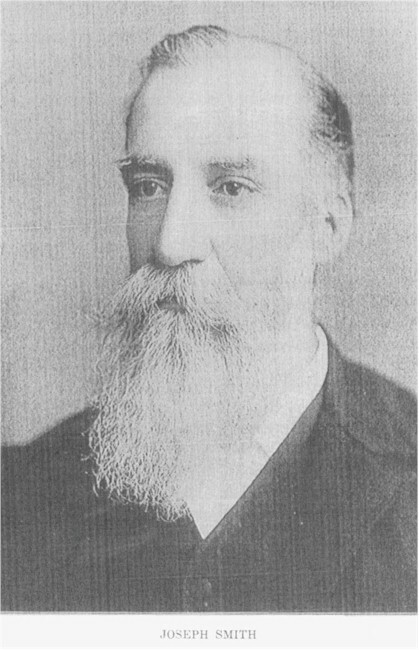 He is also president of the Lamoni branch and of the Lamoni stake and from April, 1900, until April, 1902, was business manager and treasurer of the Herald Publishing House. His enthusiasm, ability and moral stamina have done much to further the interests of his denomination in Lamoni and Decatur county and he is unsparing of his time and energy in promoting the further growth of the church. Elder Smith is a republican and has always taken much interest in the affairs of government. While living in Massachusetts he was a candidate for the state legislature and, as before mentioned, was for fourteen years justice of the peace. He continues his relations with his comrades in arms as a member of John R. Andrews Post, No. 487, G. A. R., of which he is commander. He has many friends and all who have been closely associated with him hold him in sincere respect. Joseph Smith, late president of the Reorganized Church of Jesus Christ of Latter Day Saints, was born at Kirtland, Ohio, November 6, 1832, and was the son of Joseph, Jr., and Emma Hale Smith, the latter being the daughter of Isaac Hale, a prominent and prosperous farmer of Pennsylvania. On April 6, 1830 , he and five others, organized a church, according to instruction received by divine revelation. This claim, so unusual, and coming to a people who thought they fully possessed the Christian faith aroused much opposition. In 1838, he moved his family to Missouri , settling at Far West , Caldwell county, but difficulties aggravated by misrepresentations of enemies, continued to harass the church and that fall he, with others was thrown into prison, being confined for seven long months in a noisome dungeon at Liberty , Clay county, Missouri . While they were thus imprisoned, many of the families of the saints suffered unbelievable trials and deprivations. The governor of Missouri issued an order to banish them from the state or exterminate them, and, thus many thousands of peaceable and unoffending people were driven from their rightly-purchased homes, in the cold of a severe winter, and forced to make their way as best they could to Illinois, where more humane and sympathetic people succored them. Among the number thus forced to flee for their lives was Emma, the young wife of the leader of the church, who at that time was confined in the jail before mentioned. With her two youngest sons in her arms, and little Joseph and a foster-daughter clinging to her skirts, she crossed the frozen Mississippi on foot, and made her way to Quincy, Illinois, where she found rest, food and shelter in the home of a family by the name of Cleveland. In the spring she was joined by her husband, and a home was established later at Commerce, Hancock county, Illinois , which town afterward bore the name of Nauvoo and became the great center city of the Saints. They enjoyed a period of comparative prosperity, the population of the town swelling to fourteen thousand. A magnificent temple was started in 1841, built of the native stone of the country, but it was never completed. Here, then, amidst such scenes, was spent the early life and boyhood of the late President Smith. He was baptized by his father when eight years old and later was blessed by him and designated as the future leader of the church. Perilous times ensued for the father, for he was persecuted by his enemies, and several times arrested but as often acquitted and released. Finally a requisition came from the governor of Missouri demanding him as a fugitive from justice from that state and charging him with treason. Upon examination before a competent court the requisition was denied. In June, 1844, he was arrested on charge of riot and while under arrest, on the 27th day of June, 1844, a masked and painted mob of lawless men, shot him and his brother Hyrum, to death. Following this tragedy the saints became scattered, many false leaders springing up, causing many schisms in their ranks, and two years later a great exodus occurred, thousands wending their way across the desert of the west to Salt Lake City , Utah , where Brigham Young built up his empiric stronghold. Emma Smith, the widow of the murdered prophet, steadfastly refused to acknowledge the leadership of Brigham Young, and in spite of threats, promises, warnings and pressure of all kinds brought to bear upon her, she refused to go west but remained at Nauvoo, where she reared her four sons to manhood, instilling in them fearless honesty, steadfast loyalty to conviction, loving respect for their father's memory, and supreme confidence in and reverence for God. Responding to a call which he believed to be divine, "Young Joseph" as he was affectionately called by those who knew him in those days, in 1860 attended a conference of the membership of the church, at Amboy, Illinois. There he was chosen president, being ordained to that position on April 6. This organization had been effected in 1852 and had taken a firm and uncompromising stand against the evils in the Utah faction, among which were the doctrines of polygamy, blood-atonement, spiritual wifery, etc. This stand the Reorganized Church has never abandoned. This was the work which Joseph Smith took up at the age of twenty-eight, a work to which he bent, throughout the long years of his life, his best and worthiest energies. Patiently the scattered saints built up by slow and careful steps, an organization whose pride it is to live in conformity with the rules of right conduct and right motives, believing as they do that "he who would keep the law of God has no need to break the laws of the land." From the small beginning made in 1852 this church with Joseph Smith as its president, and against fearful odds of popular misunderstanding and prejudice, succeeded in carrying out most triumphantly a high standard in doctrine and morals. How well they succeeded was partially evidenced by the fact that upon the announcement of Joseph Smith's death last winter, the press of the country almost universally united in expressions of respect and esteem. Where he was personally known, he was beloved; and where only his public work was known, that was spoken of in generous terms of approbation for its acknowledged consistency and earnestness. He was very patriotic and highly prized his right of franchise, exercising that prerogative for the last time just a few days prior to his death. His political convictions caused his support to go to the republican party, and he voted for every republican candidate for president, his first vote being cast for John C. Fremont in 1866. He studied law in his youth but never entered into its practice. He served two terms as justice of the peace in Nauvoo, and one term in Plano , Illinois , to which place he moved in 1865. He had editorial charge of the Saints' Herald, official organ of the church, from 1865 to the close of his life. He served at various times as member of school boards, having always a keen interest in affairs of education and progress. In 1881 he moved to Lamoni , Iowa , to which place the Herald publishing plant and official headquarters of the church were at the same time transferred. He, with his family, consisting at that time of wife, four sons and four daughters, arrived on the evening of October 8, and took up their residence in a commodious frame dwelling which had been built the preceding summer for their reception. It was situated on a small farm of forty acres adjoining the town limits on the west, and from this home he went daily to the Herald office, carrying on his work as editor and presiding officer of the church. He gave the name of "Liberty Hall" to his home, and his fine and never-failing hospitality, Ñ to rich and poor alike, Ñ his open door to the needy or the deserving, fully justified this title. Later, when he moved to Independence , Missouri , and the place was transformed into a residence for aged people of the church, the name was preserved and today it is known as "Liberty Home" and has sheltered many aged and deserving people. In Lamoni, as in Plano and Nauvoo, Joseph Smith's influence for good citizenship was strongly felt. He was an active advocate of temperance, and many and powerful were the addresses he made in that cause from pulpit and lecture platform. He assisted in banishing the saloon from every town he lived in and promulgated the doctrine of sobriety and abstinence wherever and whenever opportunity offered. His church associates are stanch supporters of this principle also and can be counted upon to vote almost solidly for prohibition movements. Three times has the Reorganized Church established in the courts of the land, its claim to be the only true and lawful successor to the original church as founded by Joseph Smith, Sr., in 1830. The accepted books of the church strongly condemn the doctrine of polygamy and teach instead purity and virtue of life, integrity, godliness, and everything having a tendency to exalt and ennoble the human mind, and Joseph Smith counseled the members of the church to shun any and every man who taught any principles contrary to these virtues. The enemies of Joseph Smith claimed that he was ignorant, shiftless and mischievous, and that he came of low and ignoble parentage. This has been successfully and undeniably refuted by those who have made a study of his ancestry. It is found that behind him a long line of industrious, gentle and patriotic forbears stand, and in them we may trace, to a considerable extent, many of the traits of character, which distinguished him, - as well as his son, the subject of our sketch. In both men there existed a strong love of country, and firm respect for its laws and government, as well as a deep hatred for all forms of oppression, tyranny or injustice. These characteristics may be traced to their ancestors who bore arms in defense of their country and fought for the establishment of their rights to freedom and liberty. Asael Smith, grandfather of Joseph the Prophet, was a captain of Minute Men, who marched at the call of April 19, 1775 , and helped to fire the "shot that was heard around the world." Also he commanded a company at the fortification of Dorchester Heights , and, in 1776 helped to drive the British from Boston . His father, Captain Samuel Smith, was prominent in the affairs, both civil and military, which marked the stirring days of the colonies' revolt against tyranny, being a member of the "Tea Committee," and the "Committee of Safety," and held at various times many positions of trust and service in his community. He was representative to several Provincial and Continental Congresses, where resolutions were passed, condemning the actions of their oppressors, declaring their constitutional rights, and pledging themselves and their fortunes to the defense of those rights. Energetically were those pledges redeemed; companies were raised, equipped and carefully drilled, and these farmer-soldiers later took active and effectual part in the valorous deeds which fill the history of those times and which resulted in the blessed heritage of freedom which we possess. Lucy Mack Smith, the mother of the founder of the church, also came from a family active in military affairs, her father, Solomon Mack, serving in the French and Indian wars, and the Revolution. He fought in the battle at Lake George and later was with Major Putnam in his historical engagements with the Indians. In 1776 he enlisted in the continental army, serving his country until the close of the war. His son, Stephen, held the position of major in the War of 1812, also having seen service in the Revolutionary war, although he was but seventeen when he enlisted. Major Mack was in Detroit when Hull surrendered to the British, which so disgusted him, that he broke his sword across his knee and tossed it into the lake, saying that he would never submit to such a disgraceful compromise while the blood of an American flowed in his veins. The ancestry of Joseph Smith includes many men and women who were sturdy pioneers in this country, coming here to escape oppression, or to find that breadth of liberty and expression which their natures demanded. Unflinchingly they faced the terrors and danger of this wild and unexplored country, and, gaining footholds, here and there, they helped to build prosperous New England towns. Their names Smith, French, Gould, Curtis, Towne, Bagley, Mack, Huntley, Colby, Gates, Spencer, Cone, etc., are found all through the records of those early days and to these pioneers doubtless their descendants owe many sound, noble and courageous characteristics. Enough has been written to disprove the slanderous statements made about the family of Joseph Smith. They were ever law-abiding and loyal patriots, despising treachery, oppression and injustice. In the light history throws upon his ancestors, do we not find the source of his calm courage in the face of danger, his persistency in upholding what he believed to be true, and his fearlessness in presenting those convictions? Even his martyrdom had its prototype in the death of a Protestant ancestor, John Loomis, who was burned at the stake by Catholics, under Queen Mary in 1556. Oppression in any form, was obnoxious to Joseph Smith, and the disturbances which followed the settlement of the church in Missouri had much of its origin in the strong anti-slavery sentiments they held. They believed that the Constitution of the United States made no distinction of color or race, when it declared that "all men are created free and equal." The late president of the church was most democratic and sympathetic in his attitude toward the black race. Of the personal family ties of President Smith there is this to record. He married Miss Emma Griswold, at Nauvoo, October 22, 1856 . She bore to him five children, two of whom Evelyn Rebecca and Joseph Arthur, died in infancy. His daughter Emma Josepha, born in Nauvoo in 1857, was married to Alexander McCallum in 1875. His second daughter, Carrie Lucinda, born at Nauvoo in 1861, married Francis M. Weld at Lamoni in 1887. Zaide Viola, born also in Nauvoo in 1863, was married to Richard S. Salyards in 1883. She died in 1891. After the death of his wife, Emma, Mr. Smith married Miss Bertha Madison, at Sandwich , Illinois , in 1869. To this union were born nine children, two of whom, Kenneth and Blossom, died at birth, and two others, David Carlos and Bertha Azuba, at the ages respectively of fifteen and six years. Mary Audentia was born at Plano , Illinois , in 1872 and was married in 1891 to Benjamin M. Anderson. Frederick Madison was born at Plano in 1874, and in 1897 married Miss Ruth L. Cobb. He was named by his father as his successor in the presidency of the church. At the General Conference of 1915, Frederick M. was chosen president and so ordained at Independence, Missouri, his home, on May 5th following. Israel Alexander, born at Plano in 1876, married Miss Nina Grenawalt in 1908. Hale Washington, born at Plano in 1881, married Miss Rogene Munsell in 1905. Lucy Yeteve was born at Lamoni in 1884 and was married to Jesse M. Lysinger in 1906. In 1896 Joseph Smith buried his wife Bertha and later married Miss Ada Rachel Clark at Toronto , Canada . Three sons came to bless this union, namely: Richard Clark in 1898; William Wallace in l900; and Reginald Archer in 1903, all being born in Lamoni. In 1903 President Smith went to England , his first trip to foreign lands, though he had preached in many states and territories in the United States as well as in many provinces of Canada . He visited Scotland and Wales also, returning late in the fall of the same year. In August, 1906, he moved to Independence , Missouri . Later in the year he made a trip to Honolulu , in the performance of his ecclesiastical duties. His eyesight failed him, and he spent the last four years of his life in total darkness, so far as the physical was concerned. His mind however, retained to the last, its wonderful clarity and vigor, and his counsel was eagerly sought and wisely given. All the sons and daughters of Joseph Smith, as well as the men and women who married into the family are members of the Reorganized Church . When he was stricken with his last illness, his children gathered about him, Frederick coming from his studies at Clark University , Worcester , Massachusetts , Hale from his mission field in Alabama , and others from Lamoni. For two weeks he lingered, in patience and sweet resignation awaiting the release of his weary spirit from its darkened tenement. Tenderly he counseled, and many were the scenes of the past which passed before his mind, and firmly he bore his dying testimony that Jesus was the Christ, and that he was not afraid to go to meet that Christ. Peacefully the end came at one o'clock in the afternoon of December 10, 1914 . In the ecclesiastical dogmas which made up the denominational belief of the late Joseph Smith the general public has no particular interest. But in the death of the late venerable head of the Reorganized Church of Jesus Christ of Latter Day Saints the country loses an interesting and useful citizen. Joseph Smith was considerably more than a powerful churchman into whose keeping had been committed the destinies of one of the great denominations of the world. Those who ignorantly confounded the Reorganized Church with Mormonism, in the objectionable acceptation of that term, will not appreciate the theological distinctions between the two nor understand that nothing was more hateful to Joseph Smith than the doctrines of Brigham Young, with their polygamous teachings and all the other features which make Utah Mormonism obnoxious in the eyes of the average American. But all who ever came in contact with Joseph Smith could readily appreciate the broad charity of his tenets, the untarnished private life he lived, the unswerving devotion to duty which he always displayed and the simple modesty of his relations toward his church and the world at large. To his church he was the prophet whom all its communicants revered, but he was also the unostentatious leader who constantly practiced the virtues which he enjoined upon his followers. To the world he was the blameless citizen who walked before all men as an example and whose interest in the movements that made for the welfare of the community always had his heartiest support. Perhaps nothing could give a clearer insight into the character of Joseph Smith than the directions which he issued shortly before his death in respect to his funeral. Disliking nothing so much, next to sham, as ostentation, he directed that his funeral should be conducted with the utmost simplicity, without any of the elaborateness which his followers would otherwise have provided in order to testify to the honor in which they held him. He was the prophet, but first of all he was the Christian gentleman and the good citizen. As such he lived, as such he died, as such he will be remembered by all outside the household of his faith. His followers themselves can have no legacy of remembrance more honorable than this appraisement of the people among whom he lived and labored so many years. Kindly, cheerful, loyal to his own creed, tolerant of those of others, standing for modesty, simplicity, good citizenship, embodying in his private and public life all the virtues which adorn a character worthy of emulation - such is the revelation which Joseph Smith leaves to the world, as the real interpretation of an ecclesiastical message translated into terms of human character.